Sheng Maoye was from Changzhou (present-day Suzhou, Jiangsu province). His works are praised in late Ming painting treatises by his contemporaries, although few details of his life are known. The poem inscribed on this painting is titled Late Autumn in the Mountain Studio by Xu Hun (c. AD 791- c. 858), a poet from the late Tang period (618-907). It reads: ‘The water is cold, and deeply the stones can be seen; the night in autumn is silent, and the wind can be heard’. Sheng Maoye was from Changzhou (present Suzhou) in Jiangsu province. 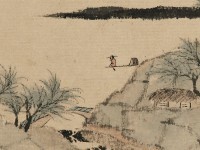 Though Sheng's works are praised in late Ming painting treatises by his contemporaries, few details of his life are known. Most of his extant paintings are preserved in Japan.